Rich's musical influences at this time included Bruce Cockburn, Peter Gabriel and U2. Rich Mullins and Niles Borop write "Why Should the Spirit of a Mortal Be Proud?" Rich Mullins writes "What Trouble Are Giants?," which he would record in 1987 for his second solo album, Pictures in the Sky. CCM Magazine includes an article about Rich Mullins. 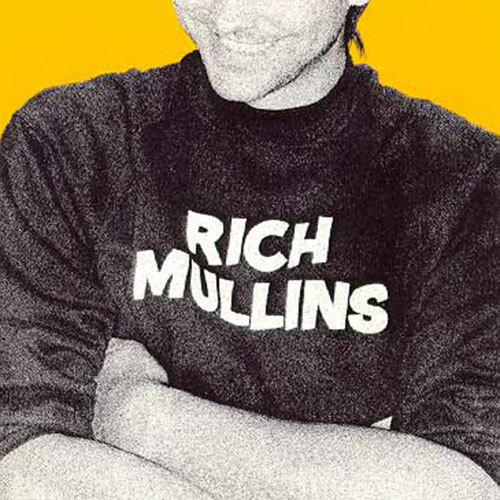 Rich Mullins first self titled solo album, is released on Reunion Records. Rich Mullins begins opening for Amy Grant's "Unguarded" tour". Rich: "It was really scary. Up until that point, all I had done was play for youth groups, and all of a sudden I was in a room with 10,000 people. It was really terrifying. I don't remember the whole thing exactly, but people tell me it happened. What they say I did was just walked out and grabbed a hold of the microphone for dear life. I also was used to being able to hide behind the piano and guitar. This time, everyone else was playing instruments and I was singing. I just grabbed a hold of the mic, closed my eyes and sang." Rich: "Amy Grant is one of those people who the more I know the more I respect her. I can't think of a single minister I have met that exhibits the kind of servanthood that she does, the kind of calmness. She's very pleasant, loving, and caring"
Rich Mullins opens for Amy Grant's Unguarded Tour in Jacksonville, FL. Rich Mullins opens for Amy Grant's Unguarded Tour in Lakeland, FL. Rich Mullins opens for Amy Grant's Unguarded Tour in Greenville, SC. Rich Mullins opens for Amy Grant's Unguarded Tour in Roanoke, VA.
Rich Mullins opens for Amy Grant's Unguarded Tour in Raleigh, NC. Rich Mullins opens for Amy Grant's Unguarded Tour in Atlanta, GA.
Rich Mullins opens for Amy Grant's Unguarded Tour in Houston, TX. Rich Mullins opens for Amy Grant's Unguarded Tour in Austin, TX. Rich Mullins opens for Amy Grant's Unguarded Tour in Abilene, TX. Rich Mullins opens for Amy Grant's Unguarded Tour in Tulsa, OK.
Rich Mullins opens for Amy Grant's Unguarded Tour in Dallas, TX. Rich Mullins opens for Amy Grant's Unguarded Tour in Midland, TX. Rich Mullins opens for Amy Grant's Unguarded Tour in Waco, TX. CCM Magazine reviews Rich's first self titled album. Rich Mullins opens for Amy Grant's Unguarded Tour in Baltimore, MD. Amy Grant performs Rich's "Love of Another Kind" on Late Night with David Letterman. Rich Mullins opens for Amy Grant's Unguarded Tour in Hershey, PA.
Rich Mullins opens for Amy Grant's Unguarded Tour in Bethlehem, PA.
Rich Mullins opens for Amy Grant's Unguarded Tour in Rochester, NY. Rich Mullins opens for Amy Grant's Unguarded Tour in Worcester, MA. Rich Mullins opens for Amy Grant's Unguarded Tour at Radio City Music Hall in New York, NY. Rich's sister Debbie: "I went with a friend to see him when he was playing with Amy Grant at Radio City Music Hall. After the concert we were standing outside, and this white limousine someone had provided for him pulled up to take him back to the hotel. He told the driver to go on because he wanted to ride with the guys in the equipment van. We said good-bye, and he left in the van. My friend said, 'Do you ever get tired of people treating your brother like he's different from you or anyone else?' When I said no, she asked why. I said, 'Because he is different. I would have gotten into the limo.'" Rich Mullins opens for Amy Grant's Unguarded Tour in Akron, OH. Rich and Amy performed "Sing Your Praise to the Lord" together. Rich Mullins opens for Amy Grant's Unguarded Tour in Fort Wayne, IN. It was during the Unguarded Tour that Rich met Gay Quisenberry, who would later become his agent and manager. 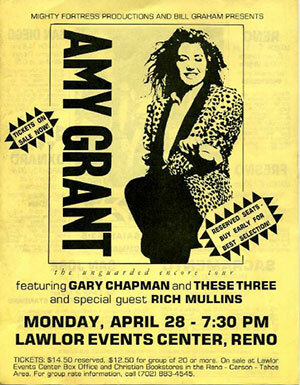 Gay: "In 1986, I was doing the booking for Amy Grant's Unguarded Tour. Rich Mullins was the opening act, but I had never met him. We were in Indiana for the first show I was working on, and we had this room for the artists to come and relax and have some refreshments. This guy comes in the door dressed in shabby clothes, and he looked like he hadn't bathed or shaved for days. I assumed he was a roady, or one of the truck drivers, so I went up to him and asked him to leave, telling him the food and drinks were for the artists. He said he was sorry and politely left and stood out in the hallway. An hour later, the show began, and the announcer said 'Please welcome Rich Mullins,' and out walks this same guy! After the show I apologized, and I asked him why he didn't tell me who he was after I told him it was for the artists, and he said he just assumed it was for the artists in Amy's band. For years to come, after we began working together full-time, he loved to remind me of our first meeting and how I ran him out of the room." Rich Mullins opens for Amy Grant's Unguarded Tour in Detroit, MI. Rich Mullins opens for Amy Grant's Unguarded Tour at the Richfield Coliseum Theatre in Cleveland, OH. Rich Mullins opens for Amy Grant's Unguarded Tour in W. Lafayette, IN. Rich Mullins opens for Amy Grant's Unguarded Tour in Grand Rapids, MI. Rich Mullins opens for Amy Grant's Unguarded Tour in Chicago, IL. Rich Mullins opens for Amy Grant's Unguarded Tour in Minneapolis, MN. Rich Mullins opens for Amy Grant's Unguarded Tour in Omaha, NE. The 20th Annual Dove Awards airs. Rich hosted. Rich begins to write "Calling Out Your Name" while driving through Nebraska on the Ungarded tour. Rich: "The first line of that I wrote when I was on tour with Amy Grant on the Unguarded tour I think or whatever tour that was. That was years and years ago. We were driving through Nebraska and there was a big beautiful full moon and I don't know how it happens but I just thought well, the moon moved past Nebraska and spoke laughter on those cold Dakota hills. Buffalo Bill. (laughs) That was where it started. I went, 'Oh I will use that someday. I have no idea where but I know I will use it.' And so I just kind of stored it away. Then I was riding my motorcycle in the Flint Hills and pretty much finished the song there. This would have been six years later that I finished it. But I do that. I keep little scraps. I think writing-wise, I am probably more of a quilter than a weaver cuz I just get a little scrap here and a little scrap there and sew them together." Rich Mullins opens for Amy Grant's Unguarded Tour in Boulder, CO.
Rich Mullins opens for Amy Grant's Unguarded Tour in Laramie, WY. Rich Mullins opens for Amy Grant's Unguarded Tour in Phoenix, PA.
Rich Mullins opens for Amy Grant's Unguarded Tour in Boise, ID. Rich Mullins opens for Amy Grant's Unguarded Tour in Reno, NV. Rich Mullins opens for Amy Grant's Unguarded Tour in Concord, CA. Rich Mullins opens for Amy Grant's Unguarded Tour in Inglewood, CA. Also appearing on the bill is Steve Taylor and Some Band. "Elijah" debuts on the AC Charts. It would spend 4 weeks on the chart and peak at #26. Rich performs at Christ in Youth in Adrian, MI. Songs included "Offertory Rag (Instrumental)," "When You Love" (a song he wrote "on his motorcycle"), "Save Me," "Beggar's Ball," "Elijah." "These Days" debuts on the AC Charts. It would spend 4 weeks on the chart and peak at #29. Rich Mullins performs at Cincinnati Bible College. The Cross Examiner publishes an interview with Rich Mullins. "Live Like You'll Die Tomorrow: Rich Mullins Speaks His Mind"
Pam Mark Hall 's Keeper is released. The album includes a song she cowrote with Rich, called "Jordan." Rich Mullins performs in Elgin, IL. Rich Mullins performs in Lombard, IL. in the morning. Rich Mullins performs at Christian Life Church in Mt. Prospect, IL. in the evening. Rich Mullins performs in Naperville, IL. Rich Mullins performs in Chicago, IL. Rich Mullins performs in Beloit, WI. Rich Mullins performs in Aurora, IL. Rich Mullins performs in Evergreen Park, IL. Rich Mullins performs in Waukesha, WI. Rich Mullins performs in Dundee, IL. Rich Mullins performs a benefit concert at the Highland High School in Highland, Indiana with members of Amy Grant's band backing him. Amy Grant's "Headin' Home for the Holidays" airs on NBC. The show included a concert clip of Amy performing Rich's "Love of Another Kind." Rich Mullins performs at the Christ in Youth Conference in Denver, CO.